Fall is around the corner, and who doesn’t love fall? The cool air taking the place of hot, humid summer. The leaves on the trees morphing colors to make a gorgeous backdrop for the potential wedding of your dreams. Picture it: a beautiful 70-degree day, surrounded by all of your friends and family while they watch you join as one with your soulmate. You smell a fireplace or campfire burning in the distance, and perhaps you serve fresh apple cider at your reception. What an amazing day! Your attire. What are you going to wear? Long sleeves might be too much, but short sleeves might not be. Simple solutions include shawls if you are unsure what exactly the weather will be like, or planning to have long-sleeved dresses if you are certain it will be cool during the ceremony. Colors everywhere. What are your wedding colors going to be? The last thing that you want to do is blend in with your surroundings. 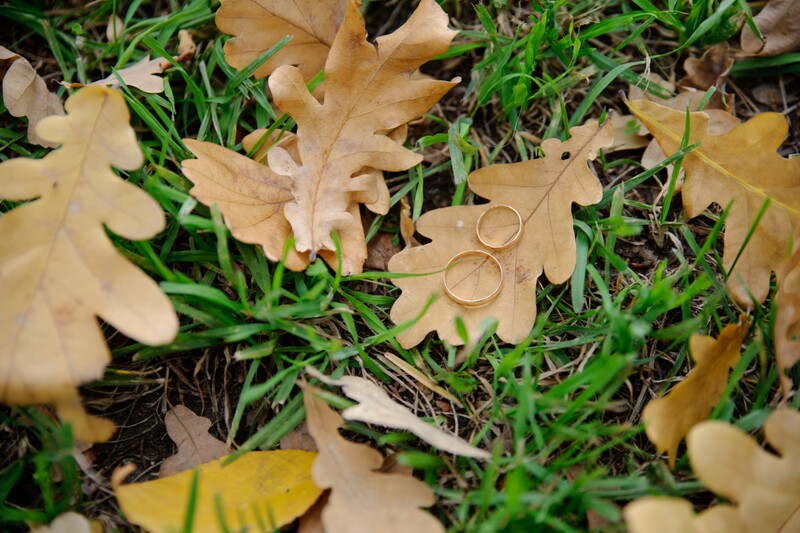 Outdoor fall weddings are often near color-changing leaves. Earthy hues are always beautiful, but having more bold colors, such as boysenberry and peach, can complement the surroundings rather than blend in with them. You want to be able to see the people in your wedding photos, after all! The reception. Where will the reception be? You don’t want to freeze out your guests. In the Southeast, you almost never know whether it will be hot or cold until the actual day of. It is best to have a space for guests to go in case it does become unbearably chilly, or too hot. Whether you want the fairytale wedding with lace and flowers everywhere, you want a more rustic feel with pumpkins and lanterns as centerpieces, or you want an all-out Halloween theme, we hope you have the day you envisioned from the start! We hope these few tips helped you make at least a few decisions out of the many that you will have to make.